Witnesses said the driver who started the accident exited his vehicle, then went back to grab a “large handful of cash.” The man was described as African American and wearing a white shirt with dark pants. He allegedly ran north from the accident scene and hopped a fence. Officers were unable to find him. Inside the man’s vehicle, a silver Buick SUV, police found a marijuana pipe with marijuana in it and “paperwork belonging to a Jonathan Jones, which had MMA information on it from the state of Nevada,” the report stated. There was also Enterprise rental car paperwork inside the vehicle. Several phone calls placed to Jones at the time were unsuccessful. An off-duty police officer identified the man fleeing the vehicle as Jones, the MMA fighter, according to the report. The off-duty officer also described the man as wearing a white shirt with dark pants. He saw him run up a dirt hill. 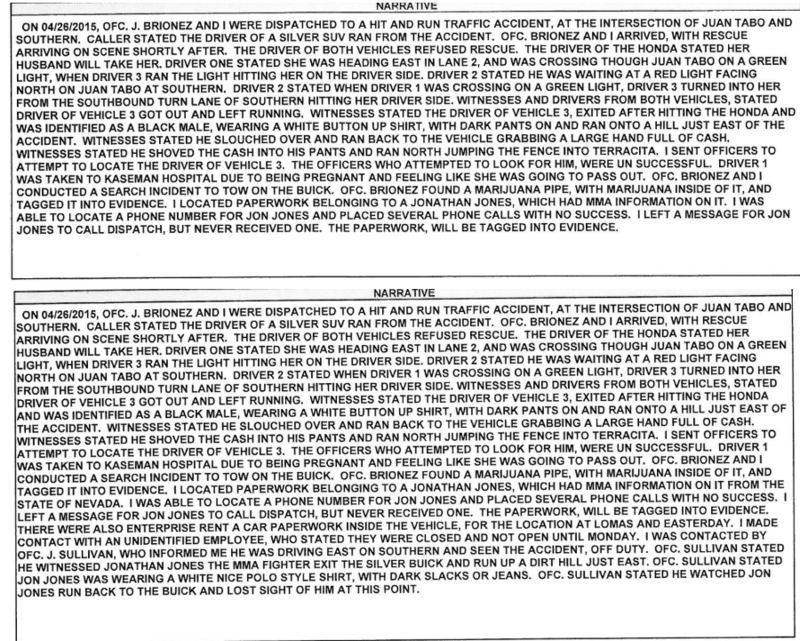 Small snippets of the police report from the accident allegedly involving UFC Champion Jon Jones. Jones was also involved in documented multi-vehicle accidents in January 2011 in New Mexico and in New York in December 2008 and January 2009. Jones was not found at fault for any of the accidents, but was cited for “unsafe passing” in the January 2009 collision with his fiancée and newborn daughter in the car with him. None of the accidents involved alcohol consumption, according to the reports. While many supporters and teammates came to the aid of Jones as reports began surfacing, this type of scenario should serve as a reminder that until full details are released, personal opinions are often better left unstated. This author’s understanding of the situation from research and reading other reports is that the crime is currently classified as a misdemeanor. Police are still currently looking to get Jones’ side of the story, and there has not been an arrest warrant issued. If Jones is not able to communicate with the Police or fails to show up to any court proceedings, at that point at the very least a summons will be issued. The concerning aspects of the report obviously revolve around the fleeing of the scene by Jones but matters become worse when you throw in that Jones was observed returning to retrieve a large amount of cash from the wrecked vehicle before fleeing once again. It has also been reported that marijuana and a marijuana pipe were found in the vehicle and the reports of cocaine being found has been determined to be false at this time. The police officer who identified Jones from the rental-car documents in the SUV said he attempted to contact Jones but was unsuccessful. Albuquerque police named the UFC champ as a suspect in the crime, currently a misdemeanor, on Sunday. A spokesperson for the department said Jones was not present at his house when officers showed up, and calls to his lawyers were unsuccessful. “If Jones wants to turn himself in, that could be very easily arranged,” Tixier said. While it was reported that the Jones vs. Anthony “Rumble” Johnson fight was in jeopardy, no such report has been confirmed by the UFC. SWFight.com will provide details as they continue to emerge.